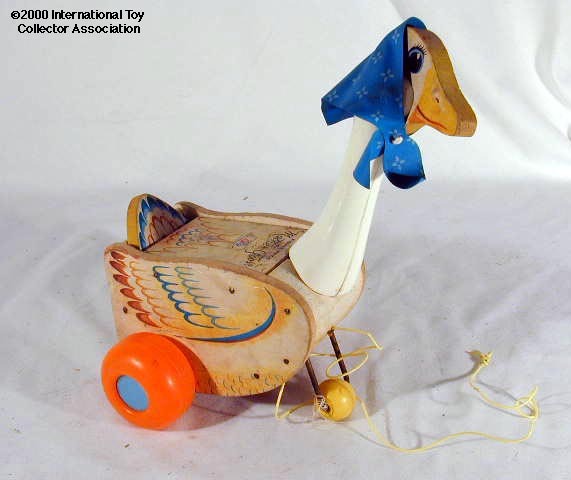 Description: Mother Goose has always been a child's favorite. The #164 Mother Goose waddles, bobs her neck and head, wags her tail feathers, and makes a "honk-honk-honk" noise when she is pulled. This fun action and sound is sure to entertain! FPT1766 - Mother Goose that waddles, bobs her neck and head, wags her tail feathers, and "honks" when she is pulled. Her body and tail feathers are made of wood. Her neck is made of white plastic and is connected with a spring that allow it to bob. She rolls on 2 red balloon-type plastic wheels that are attached to her back end and she has another smaller wheel attached to the front via a metal rod. She has a permanently attached blue vinyl bandanna with white designs on it around her head. Measures 11-1/8" high, 9-3/4" long, and 7" wide.